Kids chairs should be well made, comfortable and the right size for the children who are using them. You will want to make sure the kids have comfortable chairs to sit on while reading, writing, drawing and/or engaging in other projects. Office waiting rooms that get young visitors should invest in comfortable kids office furniture so that young visitors can sit and relax comfortably. Professionals who need kids waiting room furniture who are looking for comfortable children's couches will find that the JC Read a Round Three Piece Set, JC Kids Office Furniture Waiting Room Seating and the JC Literary Couch are all good options. Every child should have a comfortable place to sit while reading or working at school or while waiting at a doctor's or dentist's office. 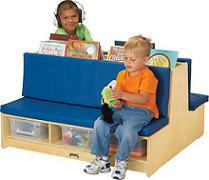 Well-made kids office furniture and chairs enable children to maintain good posture and read or work comfortably. For this reason, we offer numerous kids chairs and kids office furniture options. Contact us today to place your order for the kids chairs to fit your needs!